I’m still trying to decide how I will use this blog, now that computer technology is no longer my main focus. But yesterday I installed the latest WordPress software, imported posts from my old MovableType blog, and wrote an .htaccess file to preserve the old MT links, so I have computer technology on the mind. Here are two great utilities – one for programmers, one for everybody. I use Dreamweaver 8 (Macromedia version) for Web development and while I like it a lot, it’s a resource hog – so much so that I can’t launch my bitmap editing program at the same time to access its color selection feature. Color Cop lets you identify any color on the screen, enter a color code to see what it looks like, use a standard Windows color selector to find a color, determine whether a color is Websafe, snap to the closest Websafe color, and sample colors using multi-pixel averages. It’s nicely designed, intuitive to use, and the entire executable is just 96K. 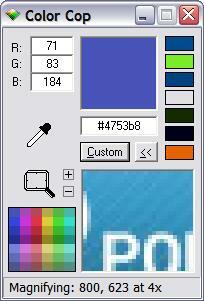 The elegance of Color Cop reminded me of another very elegant program I found that has nothing to do with programming. I live in New York City on the fifth floor of a walk-up. I like to tell myself that this is actually a good thing – saves me money on a gym. But on the downside, it’s inconvenient to walk outside to check the weather before deciding what coat to wear. I wanted a little tray program that would tell me the weather, but most weather programs are huge and full of features I don’t want or need like hurricane and tornedo alerts (not terribly relevant for New York). 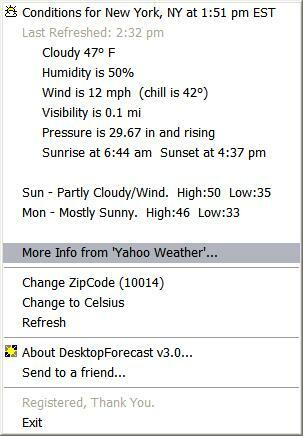 I finally came across a gem of a program called DesktopForecast. It costs all of $4.95, and it’s totally worth it. Its two little tray icons give you the main information you need at a glance. A right-click opens a context menu with more information. And if that’s still not enough for you, you can link to the Yahoo Weather site for the full scoop.